We're reviewing every single movie on AFI's List of the 100 Greatest Movies of All Time. We'll tell you why they matter, how they hold up, if they belong on the list, and then re-rank the 100 movies by quality! Today's film: American Graffiti. Find the master-list here. Fun Fact: Universal had no faith in the success of the film and shelved it for six months. It went on to become one of the most profitable movies of all time. American Graffiti is credited as being one of the first movies to use a soundtrack of popular songs to score the scenes instead of a traditionally composed score. The other movie, Easy Rider, is also featured on AFI's 100 Greatest American Movies. In 1995, the film was selected for preservation by the US Library of Congress for the National Film Registry, an honor reserved for films deemed culturally, aesthetically, or historically significant. Review: Thanks to Nick at Nite, the late-night programming counterpart to childrens’ TV monolith Nickelodeon, I grew up consuming every episode of most major sitcoms from the Sixties, Seventies and Eighties: The Jeffersons, All in the Family, The Brady Bunch, Cheers, and Happy Days, among others. Even as a kid I could sense that Happy Days (and The Brady Bunch) was a cut below more challenging, inventive and artful shows like Cheers or All In the Family. Happy Days was a neutered, nostalgic look at incredibly tumultuous times designed to remind people in the seventies of how great life was in the fifties without bringing up all those inconvenient truths that made the fifties not-so-great. History hasn’t remembered Happy Days with too much fondness or reverence-- it’s remembered as a cultural phenomenon and the piece of entertainment that brought us national treasure Henry Winkler, not as a great piece of art. So it’s baffling to me that American Graffiti, which is for all intents and purposes, indistinguishable from a 90-minute episode of Happy Days (save for a slightly darker tone and somber ending) is remembered so fondly. American Graffiti is a thoroughly mediocre exercise in nostalgia that will be of little use to those that didn’t grow up in the early sixties. There are three factors that I suspect are responsible for the esteemed reputation of American Graffiti. Star-power: George Lucas directed the film and Francis Ford Coppola produced, and film lists like the AFI 100 LOVE auteurs. 22 directors have multiples films in the AFI 100; more than half of the movies in the AFI 100 are made by a director with multiple entries. Part of this is a reflection of the studio system for the first half of the twentieth century that limited the opportunities for many would-be film-makers. It’s also probably because artists recognized as a genius for one piece of work tend to get extra leeway for their other works. It’s doubtful that all of Beethoven’s 32 sonatas were better than any other pianist’s in the early 1800’s, but all 32 have been scrutinized and written about infinitely more than his less famous contemporaries. Coppola and Lucas have four other films in the AFI top 100, which makes it easier to elevate the quality of American Graffiti. The cast, which includes Harrison Ford and Richard Dreyfuss, isn’t too shabby either. And of course, both Happy Days and American Graffiti star Ron Howard (as different characters).. Nostalgia: American Graffiti is an idealistic, rose-colored view of growing up in the early 60’s. Guess the average age of the AFI 100 panel? This film especially is in the sweet-spot of a mostly male, mostly white panel of old folks. Influence: The success of American Graffiti is, for better or worse (probably worse), largely credited for the huge influx of nostalgic film-making that is still prevalent today. This is a legitimate claim for the film’s inclusion in this list, given that lists like these explicitly reward influential and innovative films (though American Graffiti is more influential than it is innovative). 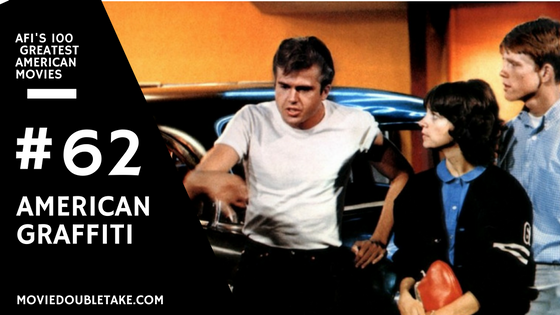 Without those three factors, American Graffiti is a largely forgettable and disposable piece of entertainment. The subplots (nerdy guy meets rebel girl, cool guy softens up to a precocious kid that looks up to him) are sitcom-level pedestrian, and the film itself seems to have little on its mind about any of it. Does it deserve a place on AFI's 100 Greatest American Movies of All Time? No. There are many better movies about growing up released before and after American Graffiti, and its biggest legacy (alerting studios to the cash-in potential of nostalgia) is a dubious one.